One of the best ways I find to feel “full” is to eat a bunch of vegetables. But what about protein? Add some feta cheese, eggs or just egg whites and you have a meal. After surgery to remove my brain tumor, my friend Janet came from California for a week to take care of me. She made me all kinds of healthy and filling meals, including green smoothies. I felt so pampered and my stomach got flatter, I mean seriously, it did. I begged her to live with us and become our cook. I even offered money. But she has a life, a job and a family in California and had to go home. Unfortunately, after she left, my stomach went back to normal. One morning she made this amazing egg frittata which really hit the spot. Plus, it’s super simple and can be made any way you like it… by changing the vegetables or the type of cheese. 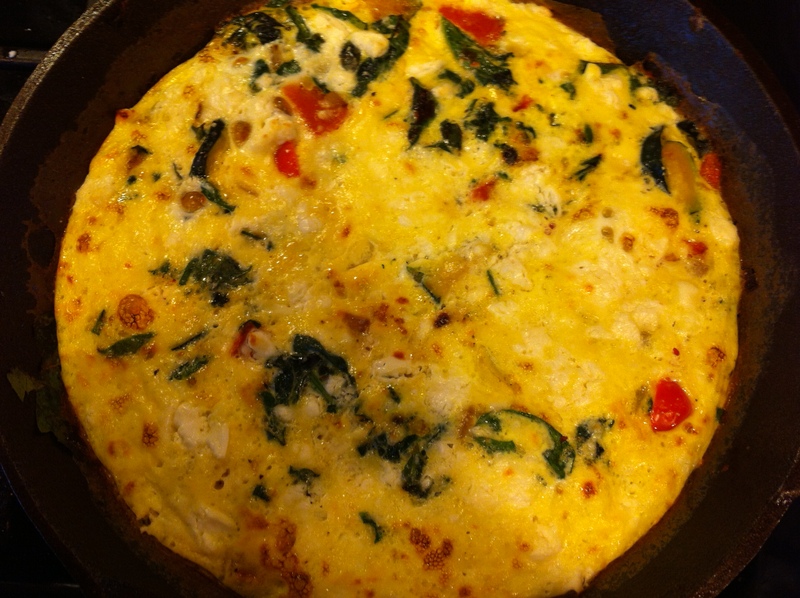 In the photo above, I made the frittata with all egg whites. You’ll need a frying pan that can go in the oven under the broiler. Cut zucchini and yellow squash into rounds, then in half. Chop onion and bell pepper. Add oil to pan and warm over medium heat. 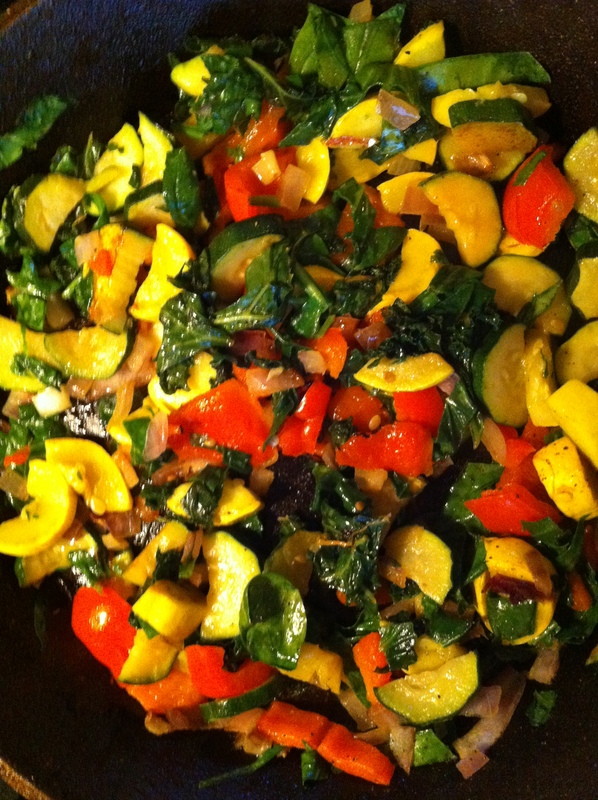 Sauté the veggies including spinach in the pan until soft. Add a little water for steaming if needed. Crack eggs into a bowl. If you want to cut back on fat and cholesterol, use 1 egg and the rest whites. I use 4 eggs in an 8″ pan and 6 eggs in a 10″ pan. Whisk with a splash of milk. Once vegetables are soft, remove them and spray the pan with Pam. 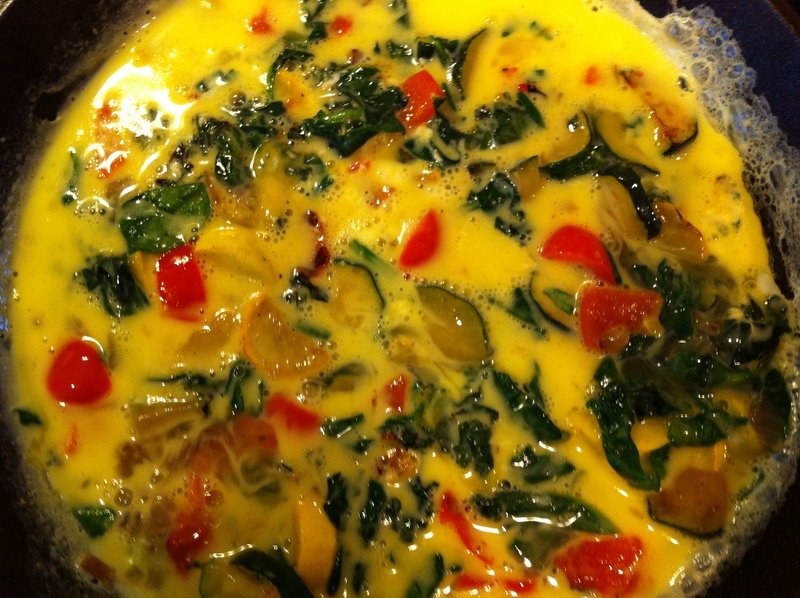 Put veggies back in and pour eggs over the top. Sprinkle with feta cheese. Cook on medium heat until eggs start to become firm. Heat oven to broil and move rack up to the second level. 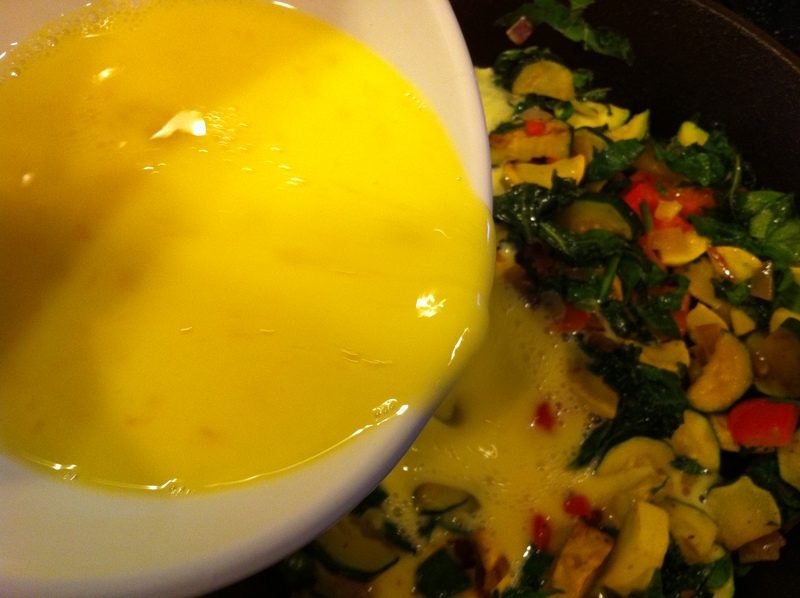 Place pan under broiler for 3-5 minutes or until eggs are cooked through (they will be firm/not soupy). Cut in wedges and serve with your favorite salsa.